Though our main business is customs brokerage, our focus is on you, our customer. At WB Skinner, clients get the benefit of deep experience combined with highly personalized service. Since staff turnover is very, very low here, you never get lost “in the system” like you could at other firms. We know you, we know your specific issues and requirements, and our attention to detail results in you saving time and money. With experience comes knowledge. Here you work with certified brokers directly, not administrative personnel. When you call, your broker answers the phone. All shipments are processed within 24 hrs, or sooner if required. Whether you require detailed entry data, or want consolidated summary invoice reports, we invoice you the way that works best for you, not us. We leverage technology wherever possible to improve speed, efficiency and transparency. With online information access, you’ll never wonder about the status of your shipment. You’ll know what’s happening every step of the way. 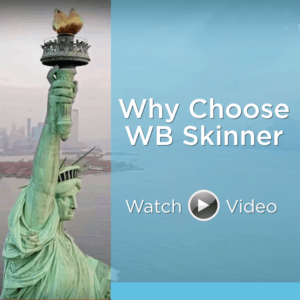 At WB Skinner—we know customs brokerage. We know New York and New Jersey. You should know us.